Back Up Camera, Bluetooth, Sun/Moon Roof, Heated Seats, Crosstour EX-L, 4D Sport Utility, 3.5L V6 SOHC i-VTEC 24V, 5-Speed Automatic, 4WD. Priced below KBB Fair Purchase Price! Odometer is 41410 miles below market average! 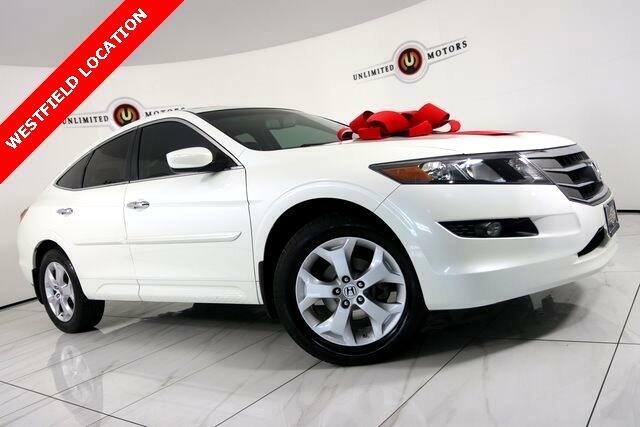 18/26 City/Highway MPG 2012 White Diamond Pearl Honda 4D Sport Utility Crosstour EX-L 4WD 5-Speed Automatic 3.5L V6 SOHC i-VTEC 24V Awards: * 2012 KBB.com Brand Image Awards 2016 Kelley Blue Book Brand Image Awards are based on the Brand Watch(tm) study from Kelley Blue Book Market Intelligence. Award calculated among non-luxury shoppers. For more information, visit www.kbb.com. Kelley Blue Book is a registered trademark of Kelley Blue Book Co., Inc. Visit our website www.iumotors.com for more pictures and info, or to apply for financing, rates are incredibly low for approved credit, extended warranties are available and insurance as well. We assure you the best experience at any of our 3 locations and unbeatable prices and quality. At Unlimited Motors we believe in "MARKET VALUE PRICING" all vehicles in our inventory. We use real-time Internet price comparisons to constantly adjust prices to provide ALL BUYERS The BEST PRICE possible. We do not mark them up, to mark them down! Our entire team is committed to helping you buy a car the way we would want to buy a car! We utilize state-of-the-art technology to constantly monitor pricing trends in order to offer our shoppers the best competitive pricing and value. We sell and service all makes and models of Pre-owned / Used Vehicles Used Cars, Used Trucks, Used Sport Utility, 10K under used cars, Ford, Chevrolet/Chevy, Honda, Toyota, Porsche, Land Rover, Jaguar, INFINITI, Audi, Nissan, Mazda, Hyundai, Chrysler, Jeep, Dodge, Ram, SRT, Mitsubishi, Lexus, Kia, Volkswagen, Mini, BMW, Mercedes, Fiat, Volvo, GMC, Cadillac, Lincoln as well as other brands. Proudly serving these areas of Indianapolis, Fishers, Carmel, Noblesville, Greenwood, Avon, Plainfield, Zionsville, & Brownsburg.